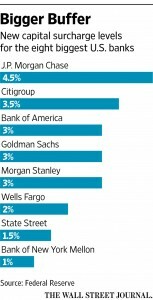 J.P. Morgan faces highest capital increase of the group at 4.5% of risk-weighted assets. The Federal Reserve sent a message to the largest U.S. financial firms: Staying big is going to cost you. The Fed’s warning, articulated in a pair of rules it finalized Monday, is among the central bank’s starkest post-crisis regulatory moves pressing Wall Street banks to reconsider their size and appetite for risk. The Fed completed one rule stating that the eight largest banks in the country should maintain an additional layer of capital to protect against losses, its plainest effort yet to encourage them to shrink. At the same time, it offered a reprieve to General Electric Co. ’s finance unit from more-intensive regulation, after the company promised to cut its assets by more than half. The moves reinforce the central mandate of the Dodd-Frank financial overhaul law signed by President Barack Obama five years ago. Regulators have pushed big banks to expand their capital buffers to better absorb losses, reduce their reliance on volatile forms of funding, improve their risk management and cut back on risky assets. So-called stress tests measure banks’ resilience each year and can restrict shareholder payouts at firms that don’t pass. For Wall Street banks and their investors, the emerging regime presents a series of choices: specifically whether to pay the cost of new regulation, which will fall to the bottom line, or change their business models by shedding businesses or withdrawing from certain markets, such as owning commodities.